The Pioneer 21inch CarisTouch has been discontinued. No direct replacement is available. 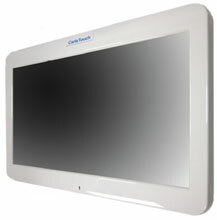 The 21inch CarisTouch is a state-of-the-art All-in-one touchscreen computer, designed specifically for the health care applications. Powered by Intel, its rugged design allows the 21inch CarisTouch to withstand the harsh and demanding health care environments. Every 21inch CarisTouch screen is built to protect against liquid sprays, and can withstand millions of touches. Its enclosure contains an antimicrobial additive to prevent the growth and spread of surface micro-organisms and bacteria.